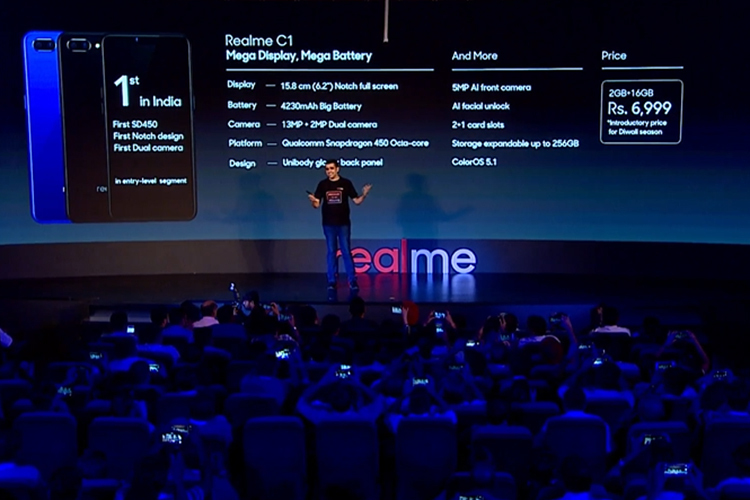 At the recently concluded Realme 2 Pro launch, the company surprised audiences with an all new offering in the entry-level smartphone segment – the Realme C1. Priced at just Rs. 6,999, the new Realme C1 packs a Qualcomm Snapdragon 450 SoC coupled with an Adreno 506 GPU, 2GB RAM and 16GB of internal storage. The smartphone also packs an impressive 6.2-inch HD+ notched IPS display with an 19:9 aspect ratio, giving the device an 88.8% screen-to-body ratio. The screen is also protected by Gorilla Glass 3, which will protect it against minor scratches and scuffs. 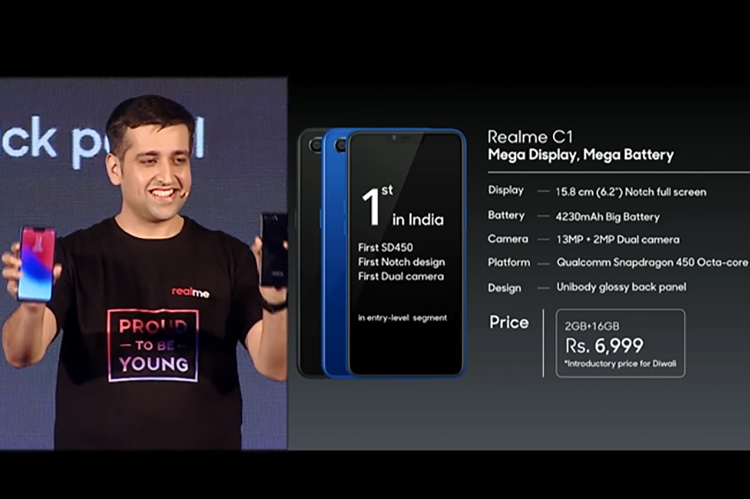 In the camera department, the budget Realme C1 includes a dual camera setup on the back with a 13MP f/2.2 primary sensor and a 2MP f/2.4 secondary sensor for depth perception. Up front, the device features a 5MP f/2.2 selfie shooter with AI beautification 2.0, AR stickers and a software enabled bokeh mode. At its price point, the Realme C1 aims to compete with the Xiaomi Redmi 6A and the Honor 7S. While the device really seems like a steal at the price, it has its own share of shortcomings. The smartphone lacks a fingerprint sensor, relying solely on its front-camera based face unlock feature for biometric security. The device packs in a triple slot SIM card tray with support for dual SIM dual VoLTE and a dedicated microSD card slot for expansion. The new Realme C1 will ColorOS 5.1 based on Android 8.1 Oreo out of the box. Rounding everything out is an impressive 4,230mAh battery which the company claims will be enough to deliver 44 hours of talk time on a single charge. Other connectivity options include Bluetooth 4.1, a 3.5mm headphone jack, microUSB 2.0 port and WiFi. It’s worth noting that the Rs. 6,999 price tag is just part of an introductory Diwali offer and the company hasn’t revealed what the actual price of the device will be once the offer runs out. The Realme C1 will go on sale exclusively through Flipkart with the first sale scheduled for October 11.